I have noticed this about myself: I go through phases where I’m excited about cooking and trying new recipes, and then I go through phases where I just get a little bored with it. I find myself making the same simple things over and over, and it feels sort of blah. One of the best things about joining the CSA at Basket of Life Farm is that the beautiful, fresh produce they grow really keeps cooking exciting! Today, I rushed home from work ready to try cooking something brand new – fried cabbage. (Brand new to me, at least!) I have to thank Audrienne (my Uncle Kim’s mother) for this idea – she knew I was looking for new cabbage recipes, and suggested that I try frying it. I had never heard of fried cabbage, but when I asked my boyfriend, Brian, about it, he was amazed (and slightly appalled) that I had never tried it! Brian suggested that I make it with buttered noodles and top it with some sliced hot peppers to kick it up. I had one head of cabbage left, so that’s exactly what I did! Now, from what I can find online, “frying” cabbage isn’t really frying the way I think of it. It’s more of a saute – Audrienne, please tell me if I did it right! It turned out to be a beautiful dish, and the bite of the hot peppers was perfect with the mild cabbage and noodles. Here’s what I did: I chopped a few strips of bacon and cooked them in a large, heavy bottom pan until they were crisp. I removed the bacon from the pan and added some olive oil to the bacon fat. I tossed in the sliced cabbage with a bit of salt and cooked that over medium heat until it was just a bit tender (maybe 8 minutes or so? I wasn’t really watching the time – oops). While that was working, I cooked some angel hair pasta from Ohio City Pasta, then tossed that in some herb butter. 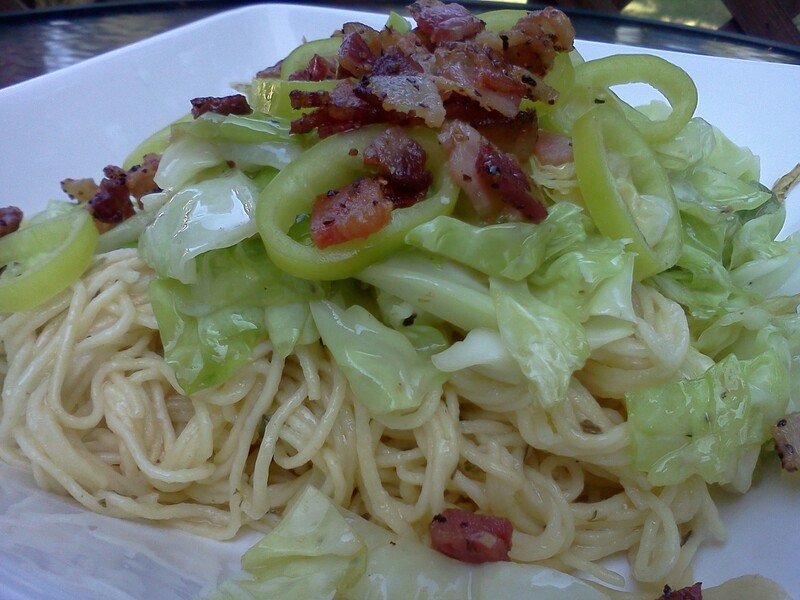 I piled the noodles in a bowl, topped that with the cabbage, then added a Hungarian hot pepper sliced in rings and the bacon bits for garnish. Pretty and tasty! This entry was posted in CSA, Dinner, General and tagged Basket of Life Farm, cabbage, CSA on July 23, 2012 by Melissa. Hmmmmmmm. I like the idea of the hungarian hot peppers. Come and link up to this week’s CSA link party when you get a chance…http://inherchucks.com/2012/07/19/whats-in-the-box-35/. Looking forward to having you there! Happy to share! It did need some heat, though. If you’re not a fan of hot peppers, I would suggest a little crushed red pepper added to the cabbage. I linked up! Thanks again for the invite! Looks beautiful and delicious! I love fried cabbage and have not had it in years and years! I definitely will try it this way, Melissa. I will tell Nana Drene to check the blog since you gave her credit! And please tell her I said “Thank you!” for the idea! It was definitely a yummy dinner. Thanks to you Melissa, I know what I am doing with the cabbage you gave me. I have never done cabbage that way, but it looks great! I can see how it would need a little heat. Yummy! I will admit that I was a little bit sceptical. You know I’ve never been a huge fan of cooked cabbage! But it really turned out to be tasty. Who knew I liked cabbage this much? This looks amazing. I’m making this next week! If you try it, let me know what you think! I was thinking that the cabbage without the noodles could be a good side dish, too.